Division on Engineering and Physical Sciences. Sign up for the DEPS newsletter. Information technology (IT) is widely understood to be the enabling technology of the 21st century. IT has transformed, and continues to transform, all aspects of our lives: commerce and finance, education, employment, energy, health care, manufacturing, government, national security, transportation, communications, entertainment, science, and engineering. IT and its impact on the U.S. economy-both directly (the IT sector itself) and indirectly (other sectors that are powered by advances in IT)-continue to grow in size and importance. In 1995, the National Research Council's Computer Science and Telecommunications Board (CSTB) produced the report Evolving the High Performance Computing and Communications Initiative to Support the Nation's Information Infrastructure. A graphic in that report, often called the "tire tracks" diagram because of its appearance, produced an extraordinary response by clearly linking government investments in academic and industry research to the ultimate creation of new information technology industries with more than $1 billion in annual revenue. Used in presentation to Congress and executive branch decision makers and discussed broadly in the research and innovation policy communities, the tire tracks figure dispelled the assumption that the commercially successful IT industry is self-sufficient, underscoring through long incubation periods of years and even decades. The figure was updated in 2002, 2003, and 2009 reports produced by the CSTB. With the support of the National Science Foundation, CSTB updated the tire tracks figure. 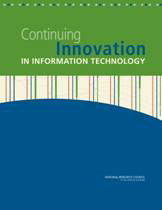 Continuing Innovation in Information Technology includes the updated figure and a brief text based in large part on prior CSTB reports. A free copy of the report can be download here. Download the “tire tracks” graphic itself or a poster or trifold brochure based on the report. NOTE: Permission is granted to reproduce this figure with no additions or alterations, for educational, not-for profit use only. For all other requests, please contact permissions@nas.edu.